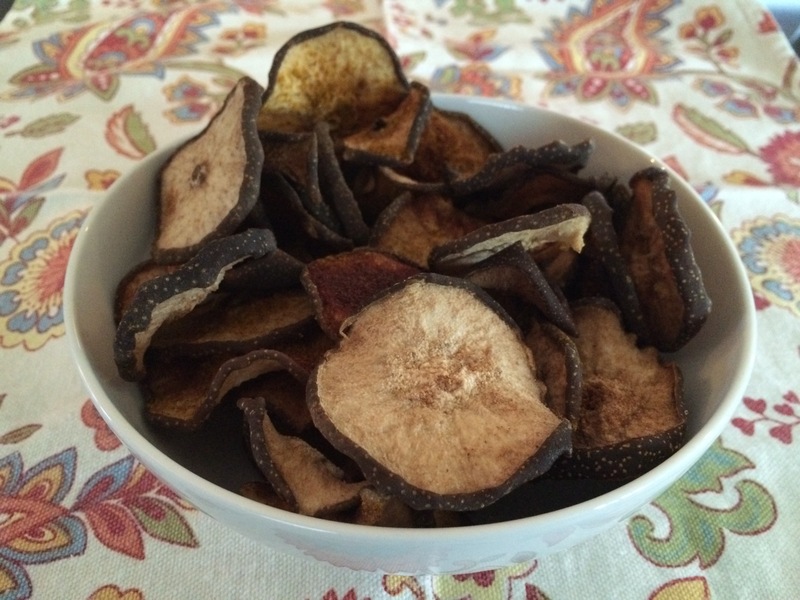 Dried Asian Pears with Curry and Cinnamon – Preserving the Harvest – Odds & Hens : Ramblings. Creations. Last year I finally broke down and bought a food dehydrator after years of concern that it would be just another appliance taking up space. Granted it isn’t running 365, but when it is time to harvest fruit or there is a great sale at the market, my Nesco Snack Master Pro (amazon affiliate) becomes indispensable. I also found myself up to my eyebrows in jam and dehydrating offers another alternative to preserving food. Someday I might be an “Excalibur” level dehydrator but after lots of research and polling the audiences, I settled on the Snackmaster. Besides, it is fun to say snackmaster and easy to add trays, clean and adjust heat setting. For this recipe, I used crisp sweet Asian pears because that it what grows in my back yard, but any pear would do and I would venture to say that the curry and cinnamon and a little sugar would work on apples and bananas and other fruits. I like the sneaky subtle spice of the curry with the classic cinnamon. I use just a tiny bit of sugar but you could absolutely just skip that part and have it be plain fruit. Some people will so a quick swipe through some lemon water to help prevent browning but it doesn’t bother me (and seems to be minimal), the cinnamon hides it and it adds another step. I don’t measure anything but mix together maybe a tablespoon of sugar with a lot of cinnamon (3 teaspoons? more?). This made enough for two full Snackmaster loads of pears. I put the curry on separately, for no good reason, other than trying to keep it really light. Pear preparation: Wash, dry and you can peel them if you like. I usually leave it on but Asian pear peels can sometime ‘russet’ or get thicker and in that case I peel off part of it. Now you can cut in half and scoop out the core with a melon baller, and slice into thin wedges or slices, even leave the stem on for decoration if you like. This year I sliced horizontally, sometimes leaving the core in (removing seeds) and other times i cut it out, especially if it felt tougher. Layer the fruit into dehydrator. Sprinkle on curry powder and then cinnamon sugar. I only put it on one side, and it leaves more than enough flavor. you could also dip the slices in the spice mix and then place on trays. How think you slice the fruit determine the drying time. I aim for a scant 1/4 inch, closer to an eighth but my knife skills are amateur and I was too lazy to get the mandolin out. 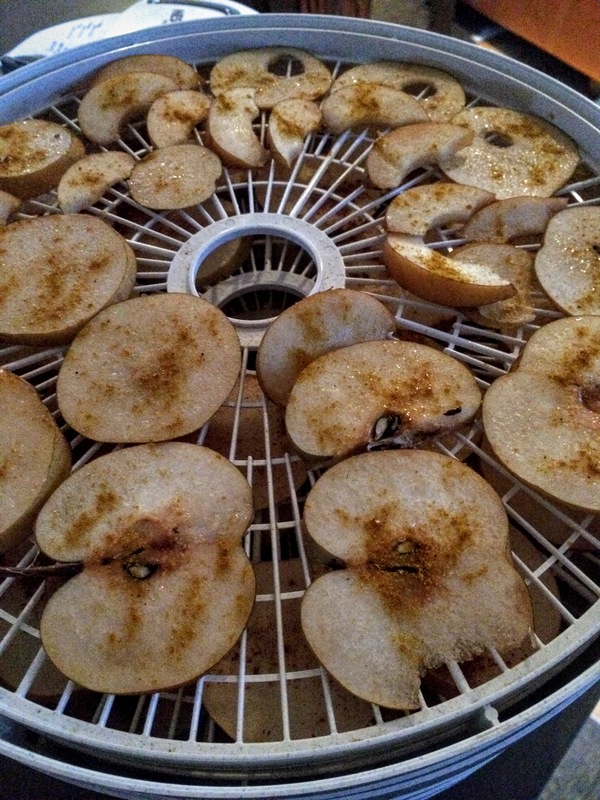 Turn on your dehydrator, about 135F for 8-12 hours. Once dried appropriately let cool and then store in a zip lock, glass jar, food saver or just eat them right away. They are a health snack, good in oatmeal or baked into cookies. Bonus! Your house will smell like pear pie, fall and hugs. Yay! Citrus Wreath – perfect for Holidays! Ok, not dehydrator but curry corn muffins! Hello Dolly! Sweet Gooey Treat Bars…. Pingback: Red Wine, Madras Curry, Tandoori and Rosemary – Four New Perfect Pear Jam Flavors – Odds & Hens : Ramblings. Creations.